The one handed tennis backhand technique can be broken down into the following sequences. 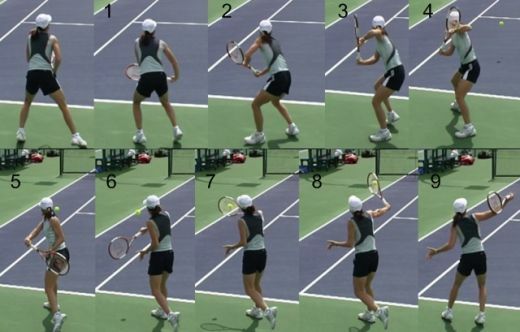 Please refer to Justine Henin's one handed backhand photo sequence as you read through the instructions. Justine has one of the best, text book perfect single handed backhands in tennis. Move your outside foot (left foot for right handed players) towards the ball. Transfer your weight to the outside foot and turn your shoulders. Because you turn your shoulders your racket will go back. Use the non hitting arm to point the racket head towards the sky. Relax the hitting hand. Use non hitting hand to rotate the racket to your backhand grip. Then grip the racket again with the hitting hand. Racket head stays pointed up while the grip change happens. Use your shoulders and arms to take the racket back fully and turn shoulders sideways to the net. Step across your body with your inside foot and transfer weight to that foot. At the same time drop racket head down behind your back. As you drop your racket behind your back your hitting arm straightens. The other arm is still on the racket for support. Let go of the other hand and swing around your shoulder to get the racket head to contact the ball. Upper body moves a little towards the net. Turn your shoulders and rotate your upper body to swing the racket in a follow through. It is very important to keep the relative position of your hitting arm and the racket the same well into the follow through. To complete the tennis backhand, the non hitting arm extends back for balance.